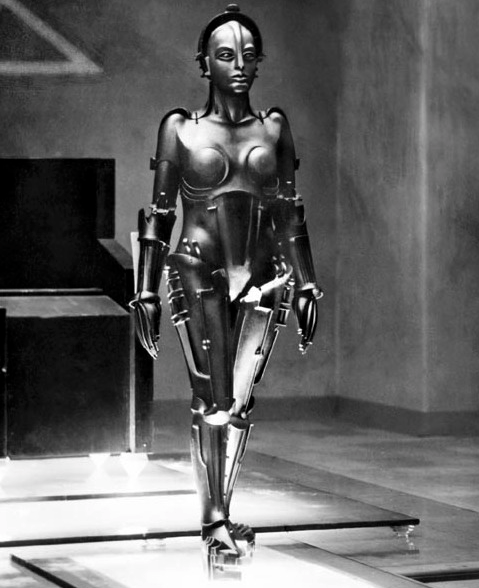 I never cease to be amazed by Maria’s robot transformation scene in Metropolis. The robot design is itself beautiful but the transformation and its mix of animation, practical effects, and time lapse photography are beautiful to behold. And to think this was all done in the 1920’s! Amazing! Robbie provided an entire generation with a view of what a sci-fi robot was supposed to look like and how it was supposed to behave. A seemingly all-powerful machine, Robby is also imbued with sophisticated manufacturing capabilities and he’s programmed to protect life, a feature that later in the movie provides the basis for a significant plot point. An added attraction is that Robbie appears in a movie that is just plain gorgeous to view. Possibly the most physically unique robot to ever appear in a motion picture, TARS is also programmed with a sense of humor. Most wondrous to behold his TARS’method of speedy locomotion on the water planet that takes advantage of his interlocking and segmented construction. Amazingly, TARS also operates efficiently in zero gravity. This is possibly the best movie ever made about what happens when robots think and act like humans. The “mecha” operate in a no man’s land outside human society where they are discarded or attempt to escape physical and sexual servitude. The main focus of the movie is a child robot who insists he wants to be a “real boy” thereby creating an unresolvable conflict in the human world. Some of the scenes in this film are intentionally disturbing. There are any many more, of course, but these are my favorites. What’s on your list?